Raazi earned ₹ 1.80 Cr on its 21st Day, Now Total Collection ₹ 109.84 Cr! Raazi earned ₹ 1.92 Cr on its 20th Day, Now Total Collection ₹ 108.04 Cr! Raazi earned ₹ 1.80 Cr on its 19th Day, Now Total Collection ₹ 106.12 Cr! Raazi earned ₹ 1.82 Cr on its 18th Day, Now Total Collection ₹ 104.32 Cr! Updated: Raazi earned ₹ 9.45 Cr on its 10th Day, Now Total Collection ₹ 102.5 Cr ! Raazi earned ₹ 4.42 Cr on its 17th Day, Now Total Collection ₹ 100.5 Cr! Raazi earned ₹ 4.20 Cr on its 16th Day, Now Total Collection ₹ 96.08 Cr! Raazi earned ₹ 2.25 Cr on its 15th Day, Now Total Collection ₹ 91.88 Cr! Raazi earned ₹ 3.15 Cr on its 14th Day, Now Total Collection ₹ 89.63 Cr! Raazi earned ₹ 3.15 Cr on its 13th Day, Now Total Collection ₹ 86.48 Cr! Raazi earned ₹ 3.30 Cr on its 12th Day, Now Total Collection ₹ 83.33 Cr! Raazi earned ₹ 3.70 Cr on its 11th Day, Now Total Collection ₹ 80.03 Cr! Raazi earned ₹ 7.45 Cr on its 10th Day, Now Total Collection ₹ 76.33 Cr! Raazi earned ₹ 7.54 Cr on its 9th Day, Now Total Collection ₹ 68.88 Cr! Raazi earned ₹ 4.75 Cr on its 8th Day, Now Total Collection ₹ 61.34 Cr! Raazi earned ₹ 5.35 Cr on its 7th Day, Now Total Collection ₹ 56.59 Cr! Raazi earned ₹ 5.90 Cr on its 6th Day, Now Total Collection ₹ 51.24 Cr! Raazi earned ₹ 6.10 Cr on its 5th Day, Now Total Collection ₹ 45.34 Cr! Raazi earned ₹ 6.30 Cr on its 4th Day, Now Total Collection ₹ 39.24 Cr! Raazi earned ₹ 14.11 Cr on its 3rd Day, Now Total Collection ₹ 32.94 Cr! Raazi earned ₹ 11.30 Cr on its 2nd Day, Now Total Collection ₹ 18.83 Cr! Raazi earned ₹ 7.53 Cr on its 1st Day, Now Total Collection ₹ 7.53 Cr! 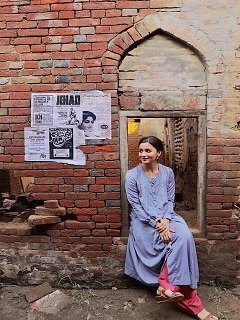 The third poster of Raazi !! Raazi Trailer on 10th April 2018 Starring Alia Bhatt and Vicky Kaushal! Actress Alia Bhatt will soon be seen in ‘Raazi’, Meghna Gulzar’s project which is being produced by Junglee Pictures.